Don't get much crafting done with PC being on the blink so I am still using my laptop. Its time for 'Less is More' Challenge again and I like the idea of the 'Metallic' theme. I have used a white base card and I have rubbed my silver ink pad all over the edges. 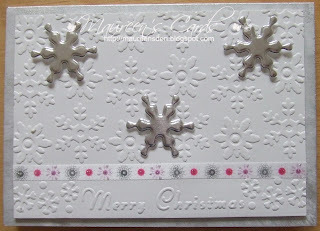 I have added a white layer embossed with a Snowflakes Embossing Folder and a Merry Christmas Embossing Folder. The ribbon is from Dovecraft Range. I have used a silver foil baking tray for the Snowflakes and they are cut with a Marianne Creatible Die. That was very inventive to use a baking tray to cut out the snowflakes... brilliant... and they look great! Great card. Brilliant idea for your snowflakes. Lovely and Christmassy Maureen, don;t think it will be that long before we have snow again! Hola Maureen, beautiful snow christmas card, good job. Gorgeous embossing, and such an ingenious use of your baking tray for the metallic snowfalkes! 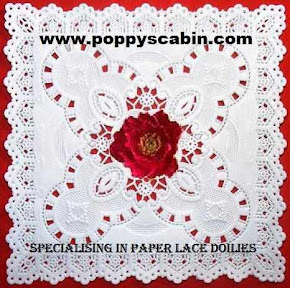 Great card, love the touch of colour in the ribbon. Fab tip re the baking tray, thankyou. Lovely card, great idea for the snowflakes.